I haven’t listened to audio books very much. They feel like cheating. Reading often involves pausing, reflecting, and rereading—perhaps because the author’s words weren’t clear or a passage was just too wonderful not to pause and reflect. In audio the words keep flowing. Yes, we can stop the recording and reverse course, but given the nature of the technology, and where and when people listen to audio books, this doesn’t seem to be a common occurrence. It’s difficult to interrupt someone when he or she is speaking, even in a recording. However, these views, taken alone, are wrongheaded. Hearing the voices of others tell us stories is probably as old as language. As children we were told stories. People read to us or we heard them on T.V., and if we are old enough, we listened to them on the radio. Now we have audio books and podcasts. There is something comforting and almost primal about hearing tales. Emotions and tones are conveyed that do not come across in print. This is obvious with certain literary forms, poetry and plays, for example. But I’m not here to talk about the vices and virtues of audio books, a topic that has received sufficient press. I am here to relate an experience that was generated by an audio recording, a podcast about a king in ancient Egypt, who ruled before the word pharaoh came into vogue. Pepi II Neferkare lived from 2284-2247 BC, and reigned for at least six decades, starting when he was six years old. This was during the Sixth Dynasty, roughly 300 years after Khufu’s workers built the Great Pyramid at Giza. Most of my audio listening takes place late at night, when I might be too tired to read, but not quite ready to drift off, only mildly conscious. This is when I first heard about Pepi II, listening to the voice of the podcaster, Dominic Perry, a pleasant chap from New Zealand, who has a series on the history of Egypt. It is said that Pepi II ruled in ancient Egypt longer than any other monarch, 64 years is one accepted figure, but some have claimed that it was for more than 90, longer than any monarch in recorded history. In any case, a long life and reign, occurring more than 4,000 years ago, in a civilization that had already been around for a millennium, give or take a few years. As schoolchildren we learned that Egyptian civilization is 5,000 years old. But 5,000 years might as well be the age of the universe, 13 or so billion years, for a ten year old. It’s difficult to make sense of numbers this large. Yet this is not only a challenge for children. The millennia of human history are difficult to grasp for adults, especially if their cultures make certain assumptions about history, in particular, that we should be able to grasp history as world history, in a single unified story. The Ancient Greeks, for example, knew that Egypt was an older civilization than theirs, but they didn’t have a linear, progressive notion of history, as we have had in the modern West. The Greeks didn’t have to tell a story that aspired to grasping the advance of humanity through the efforts of past generations, a story involving calendric time, with the promise of new ages to come, different from anything that came before. Egypt may have been very old, but there was no need for the Greeks to create a narrative that included its accomplishments. It was enough to acknowledge them here and there, from time to time. The stories of the Greeks could be more local, historically speaking. It turns out that we moderns can’t actually tell a story about the history of humanity, at least not without setting aside too many pieces of the puzzle, although we could use a story of this type to help us remember people from distant times and shores. In listening to the history of Egypt podcast, half asleep, I felt, or thought I felt, for a moment, why it’s not possible to tell such a story. It’s not only that there is too much information, too many civilizations, too many unique tales. It’s due to the sheer strangeness of past worlds, in particular, how time was experienced by a people who had at least three millennia of history before Caesar got around to crossing the Rubicon. They were a people for whom a notion of progressive development, involving generations building on the work of others, would have made little sense. There were too many peaks and valleys in their past, which stretched back to a time before humans had ways to record events in writing, the mythic past effortlessly blending with actual events. Yet, for all of the Egyptian’s differences from us, we know that their rulers sought to build grand monuments to themselves, the pyramids. Although they were moving on to another life, they too wanted to be remembered—by friends, foes, and those who were not yet born—and remembered for as long or longer than the next guy. We too long to be remembered. But looking back from our time to theirs, it all seems so futile. How many of us know the names of the kings and pharaohs who built the pyramids? And a thousand, two thousand, or five thousand years from now? In all likelihood there will be even fewer of us who know or care. And what of the workers who built the pyramids? Their names vanished a long long time ago, in a galaxy far away. Of course, this is not news. But what was new for me was the tangibility of a certain kind of foolishness: trying to overcome our own mortality through monuments or works, because there aren’t any plausible vehicles, stories, that will carry our names any serious distance into the future, to be noticed by the inhabitants of cultures not yet born. The names of the myriad of Egypt’s rulers are forgotten for all but a handful of contemporaries, even as their pyramids stand, magnificent, and lonely and sad. Even poor Pepi II, the man who may have ruled the longest, in one of the oldest civilizations on the planet, is now almost totally forgotten. I say, “almost totally forgotten,” because 4,000 years later, a man named Dominic Perry, using a technology practically born yesterday, told Pepi’s story, and a few people who had never heard of Pepi II listened. Not exactly everlasting fame, but something, rather than nothing. Photo. 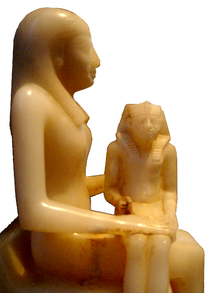 Statue of Pepi II seated on his mother’s lap. From Wikipedia. Our ability to reflect over a long period and at a large scale is a key distinction of our species. While we are not evolving much biologically we are moving and being moved intellectually. We obviously are still refining the learning process and there are still elements trying to drag us all the way back to fight or flight. What we “don’t know we don’t know” about the inventory of history is the largest category and is likely to remain so. But reflect we must and so move and change. It’s great to hear from yet another piece of that lost legacy. Ahhh the art of reflection.